Issue three of “Estudios Iranios y Turanios”, edited by A. Cantera and J. Ferrer-Losilla and dedicated to Prof. Helmut Humbach’s 95th birthday, is out now. Lecoq, Pierre. 2017. Les livres de l’Avesta. Les textes sacrés des zoroastriens. Cerf. Mazdaism (the religion of Ahura Mazda) or Zoroastrianism (the religion of Zoroaster) is one of the most ancient beliefs in the East. It was professed among the ancient Iranians and is known to us from the books of the Avesta and the later Middle Persian texts. The religion had considerable influence on Greek philosophers and on the neighbouring religious systems. However, the vicissitudes of history have gradually led these excellent texts to oblivion. From this magnificent past, remain only the modest Zoroastrian communities of Iran and the Parsis of India. However, it is indispensable to maintain this theological system from oblivion. Beyond the monotheism of Judaism, Christianity and Islam, beyond the polytheism of the Greeks, Romans and Hindus, Mazdaism offers an original treatment to the problem of good and evil. Dualism tries to resolve this common problem among theologians and philosophers in an original way. The present translation is preceded by an introduction to Mazdaism. The translation is accompanied by explanatory notes and a detailed index. We hope this book will stimulate historical studies of religion, shedding the light on the most brilliant contribution from Iranians to universal civilization. Abstract by Yazdan Safaee, based on the French original. Delaini, Paolo. 2017. La medicina nell’Avesta. Widēwdād 7, 20, 21, 22. Studio filologico, traduzione e commento dei testi avestici e medio-persiani. 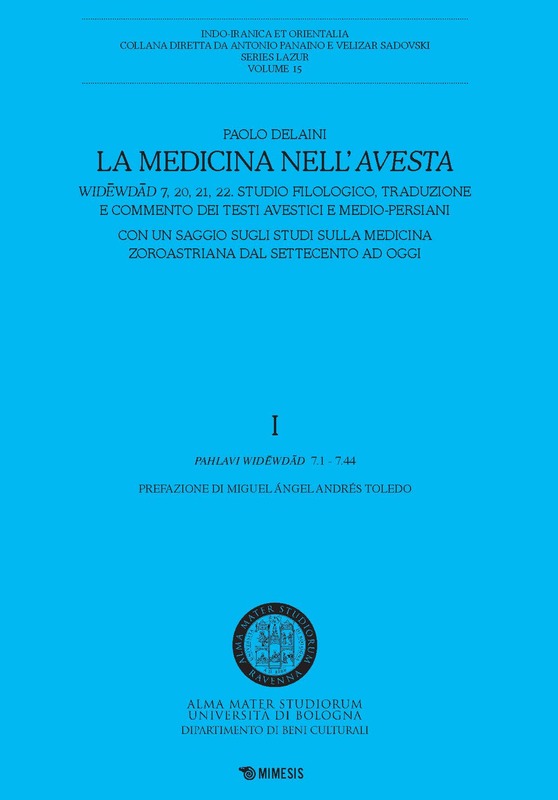 Con un saggio sugli studi sulla medicina zoroastriana dal Settecento ad oggi. I. I Pahlavi Widēwdād 7.1 – 7.44. Sesto San Giovanni: Mimesis. The present volume offers a philological study of various passages from the Wīdēwdād pertaining to medicine. Paul Delaini, is an scholar of Iranian studies at the University of Bologna, Ravenna. His research deals mainly with the history of pre-Islamic medicine in Iran, with particular emphasis on the development and circulation of medical knowledge on the body and the physiology of birth evolved from the ancient world on the late ancient and medieval tradition. Andrés Toledo, Miguel Ángel. 2016. The Zoroastrian law to expel the demons: Wīdēwdād 10-15. Critical edition, translation and glossary of the Avestan and Pahlavi texts (Iranica 23). Wiesbaden: Harrassowitz Verlag. The text Wīdēwdād – “Law Serving to Keep the Demons Away” – is one of the longest and most important sources for the study of the Zoroastrianism of the ancient Iranian and the Middle Iranian periods. The ancient Iranian text, written in Avestan, was in the Sassanid era (3rd-7th centuries) translated into Middle Persian (Pahlavi) and provided with glosses and extensive commentaries. The Pahlavi version, called zand, is of particular interest for two reasons: firstly, it is the oldest Middle Persian translation of an Avestan text, and thus of major importance for the linguistic reconstruction of Middle Persian; secondly, the annotations approach complex theological, ritual, and legal questions that examine numerous insufficiently studied areas of the Sassanid society. Despite its outstanding importance, this primary source has, due to the high degree of difficulty of the subject matter, until recently attracted hardly any attention. Miguel Ángel Andrés-Toledo’s book, based upon a careful collation of all 44 still existing manuscripts, is the first critical edition of the Avestan and the Pahlavi text of the Wīdēwdād. 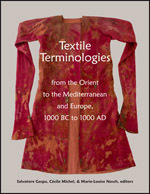 For more details see the table of the contents of this volume. Miguel Ángel Andrés-Toledo is an scholar of Ancient and Middle Iranian Lingustics as well as Zoroastrianism. He is currently a research fellow of the Department of Classical Philology and Indo-European Studies at the University of Salamanca. Jügel, Thomas. 2016. Repetition Analysis Function (ReAF) II: Interpreting Repetitions in Avestan. Indogermanische Forschungen 121(1). 1–38. Up to this point, most editions of Avestan texts have been concerned with interpreting the text. Although repetitions and abbreviations were known, they were often ignored since they did not offer new insight into the understanding of the meanings of words. The present study takes the opposite approach. Ignoring the meaning of the text (at first), it tries to detect the compositional structure of the Yasna ceremony by concentrating on formal matters such as specific closing sections, frames, etc. In a second step, the content is considered in order to offer interpretations for the compositional structure. In ReAF I (Jügel 2015), information on the technical and theoretical background of the tool “Repetition Analysis Function” (ReAF) was given and textual units were identified. In ReAF II, the results of the ReAF for the Yasna ceremony as it appears in the manuscript J2 will be presented in detail. Furthermore, I will offer an interpretation of how to transfer the structural results to an analysis of the compositional structure of the Yasna. This also allows for the formulation of assumptions on the ceremonial structure. Thomas Jügel is a Research Fellow at the French National Centre for Scientific Research, Mondes iranien et indien (UMR 7528) in Paris. Kellens, Jean. 2016. Cinq Cours Sur les Yašts de l’Avesta. (Cahiers de Studia Iranica, 59). Paris: Peeters. 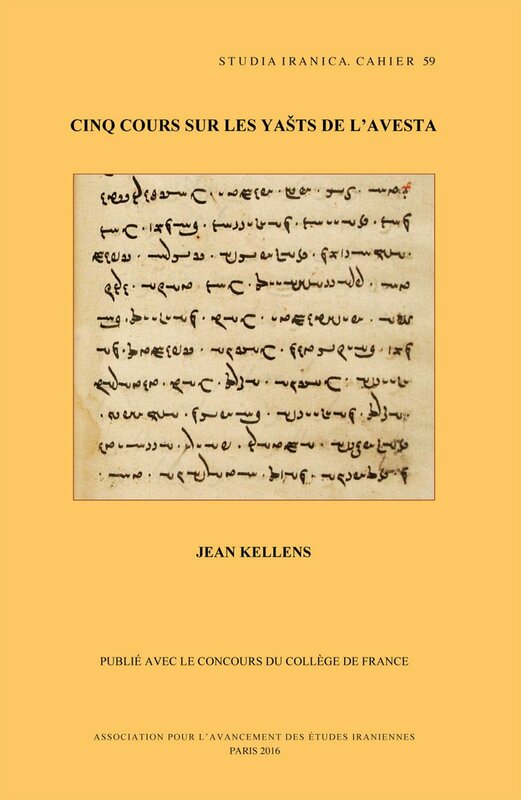 This volume includes “five courses” devoted to the Yasts, that Jean Kellens held at the College de France. They are divided into two series, each corresponding to a special period. The first three took place between 1997 and 2000: De la naissance des montagnes a la fin du temps: le Yast 19 and the two Promenade dans les Yasts a la lumiere de travaux recents, which appear here under the new titles La maintenance du monde and Le catalogue des sacrifiants. The last two titles, La notion d’ame preexistante and Le pantheon mazdeen, written in the years 2008-2011, represent a more recent reflection. Three other contributions have been added, which complete or explain more in details some reflections of the “five courses”: Caracteres differentiels du Mihr Yast, Les saisons des rivieres and Les Fravasi. The first issue of Studia Iranica 45 (2016) has been published. For a table of contents and access to individual articles, see below or visit this page. 65 – 88 – Institutional Metamorphosis or Clerical status quo?